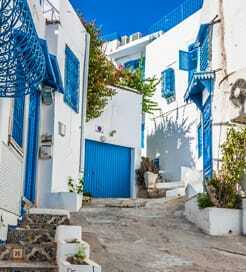 Tunisia is a slender country in North Africa, capped by the northernmost point on the continent. Bordered by Algeria and Libya, it has a 1,148 kilometre-long coastline on the Mediterranean Sea. Taking up 40% of the landmass, the Sahara Desert sweeps down southern Tunisia and is scattered with major archaeological sites like the ruinous city of Carthage, featuring the Antonine Baths. Overlooking the turquoise med, it was founded in the 9th Century BC by the Phoenicians and was rightly placed on the UNESCO World Heritage List in 1979. Tourist-friendly cities such as the capital, Tunis offer authentic shopping experiences in busy local markets, also known as souks, and French-style cuisine. Overlooking the namesake lake, Tunis hosts the country’s largest mosque and an impressive archaeological museum which houses intricate Roman mosaics. The former Roman colony of El Jem, just two hours from Tunis, is another unmissable marvel. Constructed in the third century, it contains a one of the largest amphitheatres of ancient Rome, with a capacity for 35,000 and a towering height of 41 metres. Monastir, one of the oldest cities in Tunisia, is, unsurprisingly, steeped in history; topping the list of sights is the well-preserved Forte El Ribat, affording excellent hilltop views with horse drawn carts available for tours. Hugely popular for its golden beaches, Djerba is an island off the southeast coast known for its handicraft markets and cultural influences of Berber, Arab, Jewish and African peoples. Owing to its location in the Mediterranean Sea, ferries to Tunisia come from many ports in southern Europe. The majority of routes link the capital and port city of Tunis with towns on the west coast of Italy and Palermo on Sicily, but there are also long-haul crossings from the south of France. These are also overnight sailings operated by excellent companies with large and comfortable ferries. A pleasant experience - and the cabin was value for money. Very pleasant and helpful staff. A good value return trip from Bari to Durres with GNV.Modern clean ship with nice outside cabin that are not expensive and very comfortable.Outward day trip was an hour late in leaving but the return on time which is much better than other regional ferries I have used.Bike parking was good and safe. Food was expensive, as is always the case, so bring your own.Would use GNV again. For more information, please visit our Ferries from Italy to Tunisia page. For more information, please visit our Ferries from Rome to Tunisia page. 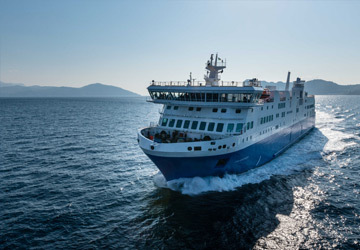 For more information, please visit our Ferries from France to Tunisia page. For more information, please visit our Ferries from Sicily to Tunisia page.